Preheat oven to 180°C (160°C fan-forced). Grease deep 22cm-round cake pan; line base with baking paper. Beat butter, essence and sugar in a small bowl with an electric mixer until light and fluffy. Beat in eggs, one at a time. Transfer mixture to a large bowl. Stir in half the coconut and half the sifted flour, half the sour cream and half the milk, then add remaining coconut, flour, sour cream and milk; stir until smooth. Spread the mixture into the pan; bake for about 50 minutes or until cooked when tested. Stand cake in pan for 10 minutes before turning onto wire rack, top-side up, to cool. 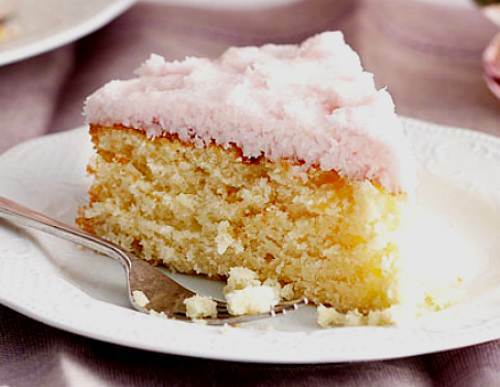 Combine sifted icing sugar in a bowl with coconut, egg whites and water; mix well. Tint with a little pink colouring.